Reserve your room at the Seneca Niagara now! SAIGE welcomes donations from people or groups who support our mission. Please enter your own dollar amount in this format 100.00. Thank you. I prefer to mail in my check with my membership application. Drum is handmade and handpainted. These are rawhide stretched over a wooden frame. 12 inch diameter (across). 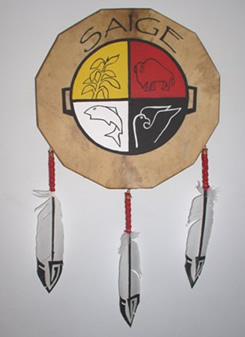 Three feathers are included with each drum. 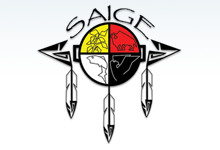 These are hand-painted white turkey feathers with the same symbol as in the full version of the SAIGE logo. Feathers are removable for shipping. Please print out this order form and mail with a check for $140.00 (Made out to Herb Webb).